Today, February 15th, we show you two African Spurred Tortoises that live quietly in the innermost part of the Water Lily Pools Zone. 2월15일 오늘은 수련못존의 안쪽에 조용히 살고 있는 며느리발톱거북을 소개드리겠습니다. African Spurred Tortoise(Geochelone sulcata) is brown-coloured, with shell up to 76cm long. Shovel-shaped forelegs have spiny scales, and spur-like scales are seen between hind legs and tails. It inhabits in savannah and other arid region, active in the dawn and in the evening, hiding itself in a tunnel or a burrow in the daytime to escape heat and desiccation. It is herbivorous and feeds on leaves, fruits, flowers of succulent plants and other plants. It seldom drinks water in wild because it can attain enough water from its food. 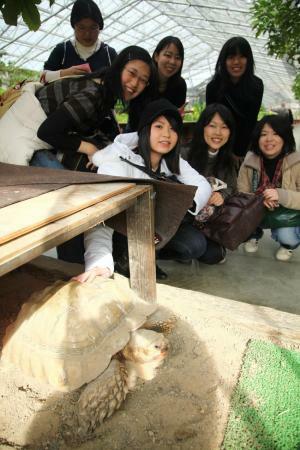 며느리발톱거북(Geochelone sulcata)은 갈색에 가장 큰 갑이 76cm.앞발이 갈구리모양으로 되여있고 뒷다리사이에는 두세개의 비늘모양의 각질마디가 있습니다.사하라사막 사반나 등 건조한 지대에 생활하며 이른아침이나 저녁때 나와서 활동하고 낮에는 깊은 굴속에서 더위를 피합니다.초식성동물로서 식물의 잎.과실,꽃,다육식물 등을 먹습니다.야생으로는 물을 별로 마시지 않으면 주로 음식에서 수분을 섭취한다고 합니다. 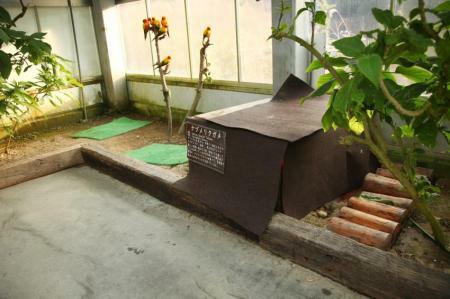 The Garden keeps two tortoises, greater one is called Gao and smaller one is Lao. Both are male about 10 years old, a staff member said. 당원에는 두마리 있는게 큰 쪽이 가오,작은 것이 라오입니다.두마리 모두 수컷인데 모두 10세좌우라고 합니다. 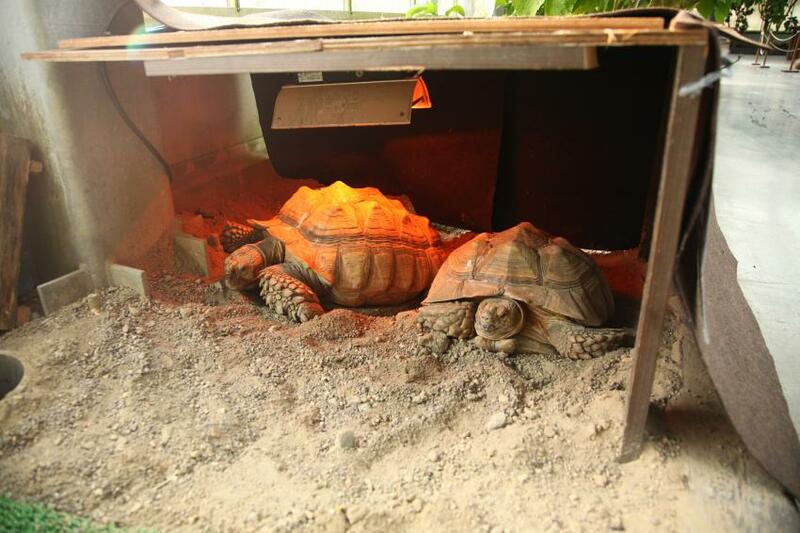 A heater is always on in the tortoise hut that was built at the innermost part of the Water Lily Pools Zone by the Parrots Handling Zone, and the tortoises rarely goes out of the hut. On warm sunny days, however, they occasionally go out of the hut for sunbathing. 수련못의 가장 안쪽,만남의 작은 길 부근에 있는 작은 거부기집안에 있는데 거기에는 난방이 켜져있어 집안에서 거의 나오지 않습니다.다만 따스한 개인 날에는 해빛을 쬐러 가끔 집밖으로 기여나온다고 합니다. A video clip of Gao fed by Mr. Tashiro a staff member. It was fed with tomato and banana;it ate up one tomato and four bananas. 타시로스탭이 가오에게 먹이를 주는 동영상을 찍었습니다.이번의 메뉴는 토마토와 바나나입니다.이날에는 토마토 하나,바나나 4개를 깨끗이 정리하였습니다. A souvenir picture of a group of visitors with Gao. 촬영중 다가온 손님께 허락을 받고 집체사진을 하나 찍었습니다.